The Sony XDCA-FS7 Extension Unit attaches to the back of your PXW-FS7 or PXW-FS7M2 via a MultiPin connector, adding additional I/O and enabling RAW data output for recording 12-bit 4K/2K RAW footage to compatible external recorders. The unit also features built-in Apple ProRes encoding for recording 1080p ProRes 422 video to an XQD card in the camera. Additionally, the Extension Unit adds Timecode and Genlock connectors for multi-camera operation, as well as a V-Mount battery connector. A 4-pin XLR DC power input and 4-pin Hirose DC power output are also provided. Note: RAW recording requires the HXR-IFR5 Interface Unit and a compatible recorder. 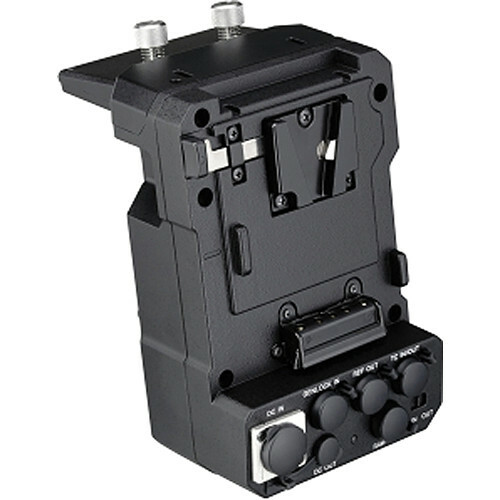 Box Dimensions (LxWxH) 8.95 x 7.2 x 6.45"
XDCA-FS7 Extension Unit for PXW-FS7 and PXW-FS7M2 is rated 4.4 out of 5 by 7. Rated 4 out of 5 by DZ from To shoot RAW and ProRes If you have an FS7, unfortunately you must buy the extension unit, Sony loves to do that, forces you to spend an extra buck to have a completed gear. However, I think it is very useful because it gives you the capacity to shoot RAW and ProRes. But if you want to shoot RAW, you got buy an extra recorder. You can record internal ProRes though. That's why I did not rate this 5 stars, because it also forces you to buy an external recorder if you would like to shoot RAW. Rated 5 out of 5 by Anonymous from XDCA-FS7 opens up some must have functions My specific need for the XDCA-FS7 was the addition of timecode and v-lock battery capabilities to the FS7. Also the ability of prores recording to internal media is a great option. I use an outboard recorder so when raw recording is needed I also now have that option. The unit fits nicely on the camera and appears to be well built. Note that you'll loose the ability to use the Sony BP type batteries due to the XDCA fan utilizes the camera battery compartment space. The XDCA is a great addition to the camera for those that require these additional functions. Rated 5 out of 5 by Russell from Timecode sync and battery V-mount Timecode sync in and out is very easy with this extension unit and the Tentacle Sync timecode generators. I use the FS7 with three other timecode sync'd cameras for events that often last 6 to 8 hours. This unit requires a lot of power and I have to use a 230Wh Lithium Ion battery for these long sessions. The unit has a 4-pin XLR DC-in socket which is useful for hot swapping batteries while recording. I edit the multi-cam clips and color grade them in Resolve 15 and I cannot find any practical difference between Sony's MXF (wrapper around their XAVC-I Codec) and ProRes 422, so I use Sony MXF for their slightly smaller file sizes. The XDCA-FS7 supports Genlock and Trigger sync and "tests" well with the Canon C300, but I have no need for exact frame synchronization. Timecode sync is more than adequate for my needs. Rated 4 out of 5 by Dave L. from Pretty Amazing - but not perfect This does what need it too, raw out and timecode. Bonus that there's no extra power cable required with the non-oem ones as this one works directly with the unit. It also has a fan on it which is nice, and the noise it generates is negligible so far. Cons I find so far is that there is no P-Tap, and the construction is plastic on the exterior (though i'm sure it'll hold up). Also, the v-lock release is a little awkward - not that it doesn't hold it securely, but it's in an awkward spot compared to all other v-lock releases - this is more of a preference thing. Lastly, the unit is quite large - so it takes up more space in your pelican or what not - it's also large enough that sound guys velcro their sync boxes to the side of the camera where the media goes, and it gets in the way lol, easy to fix, but it's just such an open spot to put velcro that it's happened multiple times after i've removed the velcro. Conclusion is - you kind of have to get this because it's the only one out there that lets you sync timecode haha - so there's nothing to compare it to. Rated 5 out of 5 by Diego from Recommended for this who really need these features Outstanding product. I feel like the FS7 was always designed with this in mind. But, perhaps due to the additional cost, Sony figured it would be best to offer this as an add-on product for those who really needed these features. I looked for this product used on eBay and elsewhere, but it wasn't easy to find a good deal on it or even find its availability. It's rather pricey for the features, and ultimately, many people may not need them. But, for my purposes, the time code generator was clutch, and the Apple ProRes was a nice add-on. Another additional plus is that this unit, along with the corresponding battery really help balance out the camera. Of course, you don't need this extension unit in particular to partner the camera a V-mount battery, so this wasn't a huge deciding factor. Other companies manufacture extension units that offer an additional battery option. The time code generator is important to me for the ability of using a time code syncing in post when we are working with multiple cameras and even when working with a separate video and sound unit. By keeping the sound person separate from the camera, we can be more fluid on set as opposed to being tethered. Generally the sound person provides the timecode generator, and although the camera generates day of time time code, the numbers can float a bit. The construction is solid, at the same level as the camera body itself. I do wish it was a little more sturdy, perhaps made of an metal alloy of some sort as opposed to what seems like hardened plastic. But, the build quality does reflect that of the camera. Rated 3 out of 5 by SOHKIAK C. from Only if you want time code and gen lock This unit is essential if you need time code and gen lock. If you require v-mount batteries, third party attachments will do nicely. If you want to record on proRes, you don't really need this attachment if you have a separate recorder. The unit does extend the overall length of the camera and adds to the weight. What type of adapter is required to convert this V mount adapter to an Anton Bauer Gold Mount? Unfortunately, there is nothing available that can safely change this adapter to a Gold mount and then power a camcorder. There is a Wooden Camera plate plus plate mount that will allow you to use a Gold mount battery on the FS7 but it does not have the added functionality the many I/O connectors the XDCA-FS7 Extension Unit for PXW-FS7 give you.In the long run, the XDCA-FS7 with v-mount batteries would be the way to go. Can I record RAW using this and the Atomos Shogun Flame? The Flame has limited support for the RAW signal. Only the Odyssey7Q+ with the RAW Bundle has full support up to 2Kp240 as the camera is capable of outputting. can the Sony XDCA-FS7 Extension unit be ordered with an Anton Bauer mount instead of V-Mount? You'll have to get one of these or an alternative to power via you gold mount batteries. In this case, it is the camera alone that controls any dual output and the XDCA-FS7 Extension Unit has no effect on that. The XDCAs main job is to enable RAW external recording and Apple ProRes encoding for recording 1080p ProRes 422 video to an XQD card in the camera. The answer to your question is the camera does not allow 4K HDMI and SDI Full HD simultaneously. The only simultaneously outputted signals are Full HD on SDI and HDMI. Can you power Sony XDCA-Fs7 with a Dracast 90W 14.8V v-mount battery? Yes, the Dracast 90Wh V-Mount battery will work on the Sony FS7 XDCA Extension Unit. The Extension unit accepts V-Mount Batteries. Is the 240 fps slow motion relevant to PAL systems (25p) or just ntsc (30p)? And only 200fps for PAL? This Sony XDCA-FS7 is principally for getting RAW to an external recorder, ProRes internally and for mounting a big battery. It is not involved in high FPS rate which the camera can do by itself. The highest PAL rate is 150FPS. does this module let one record 4K in PRORES, or is PRORES only limit to 1080p? Yes it will do 4K in PRORES.